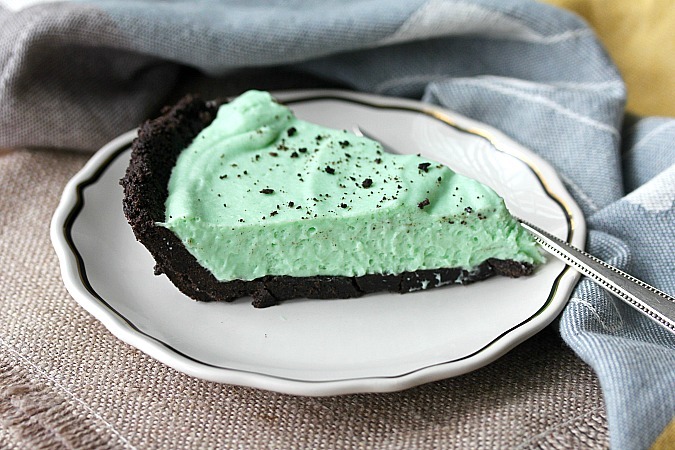 This Chocolate Mint Pie is an old fashioned recipe from the 1950s and 1960s, back when the Grasshopper cocktail was popular. 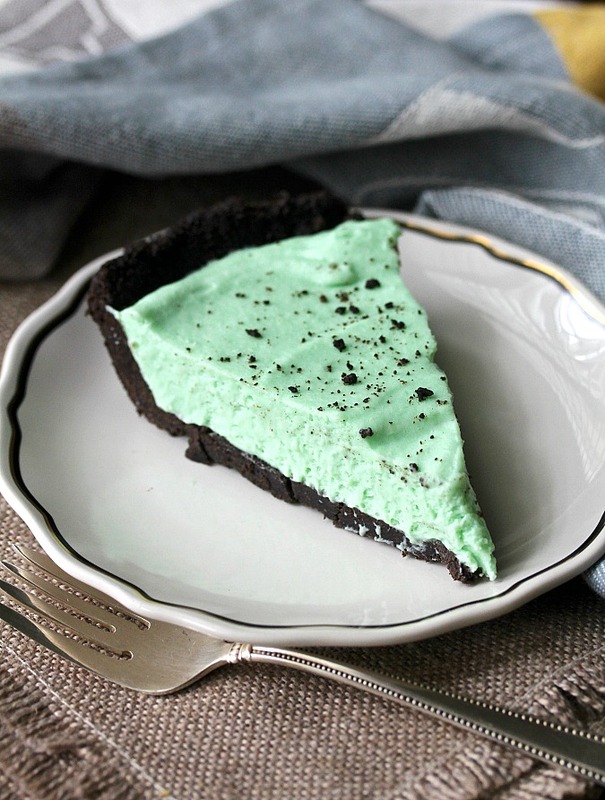 This Chocolate Mint Pie is often called Grasshopper pie in honor of the famous cocktail that originated in New Orleans. I recently cleaned out a file with accumulated recipes and came across a recipe card that my mom had given me about 100 years ago. She had given it to me after I fell in love with the flavors of this pie. Because I've been on a kick about re-making and preserving some of my old favorite recipes, I definitely needed to re-make it. My mom wasn't all that precise in writing her recipes. For example, does 1/2 pint whipped cream mean that it's already whipped? Probably not, but it's fun to speculate (and I suspect Cool Whip may have been involved). 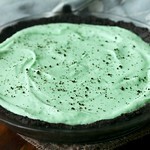 Chocolate Mint Pie, or Grasshopper Pie, combines the flavors of Crème de Menthe, Crème de Cacao and whipped cream to create delicious nostalgic dessert. The filling for this pie is sweetened with melted marshmallows. The marshmallows are fabulous too for adding structure to this no-bake pie. 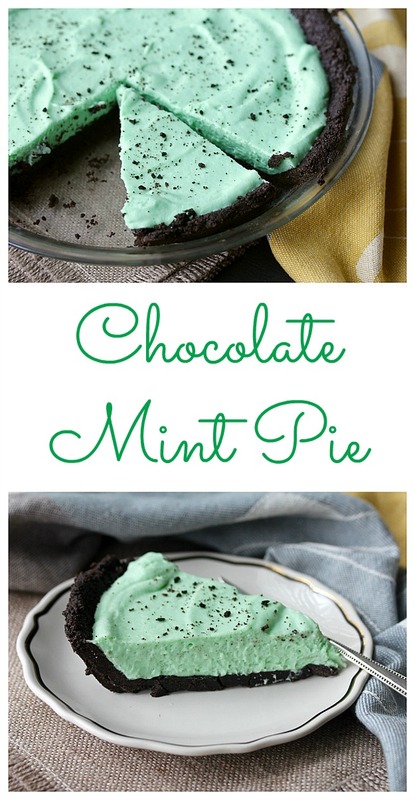 Note: I used mint extract and Nielsen Massey chocolate extract in place of the liqueurs for this pie. First, my liquor cabinet is already packed with enough specialty ingredients, and second, I wanted this pie to be safe for my grandsons. If you use the liqueurs, use two tablespoons of each. This pie, as my oldest grandson says, is "duh-lish-ous." You should have seen both of my grandsons eyes when they took a taste. If you remember the days of grasshopper cocktails and grasshopper pie, you will love this recipe. If you are too young to remember, I encourage you to give this recipe a try. You will love every bite. If you like Thin Mints, Andes Mints, or Junior Mints (the best! ), you will adore this pie. P.S. The crust is made from Oreos. I used the mint cream version, but any Oreos will do. P.S. If chocolate and mint together are your jam, you will adore these Andes Mints Cookies. After the recipe, you will find over 20 recipes for delicious sweet and savory pies for Pi Day (3.14), hosted by Colleen of The Redhead Baker. Place the cookies in the bowl of a food processor and process until finely ground. With the food processor running, slowly add the melted butter. Spray a shallow 9 inch pie pan with spray oil. Press the cookie and butter mixture into the pie pan. Refrigerate while making the filling. In a double boiler, melt the marshmallows in the half-and-half. Let cool. Add the extracts and food coloring. Whip the heavy cream to the stiff peak stage and fold it into the marshmallow mixture. Spread the filling into the chilled crust, and refrigerate for at least an hour. You can also freeze the pie for about an hour. Before serving, sprinkle the pie with cookie crumbs or shaved chocolate. This recipe looks almost exactly like my mom's recipe! And it has become a family favorite!!! Oh how fun. I love finding these old recipe cards. I love how light and fluffy this looks. I've never heard of using marshmallows as a stabilizer. It looks wonderful Karen and with the review it got from you grandson, I cannot wait to try it. I used to laugh at my mom when she would send her recipes to me. Im like mom I dont cook, you have to be more specific than that! So I can totally relate to your family recipe card! This pie looks and sounds like a winner! I love anything with marshmallows so I'll be trying this out soon! It's so funny isn't it? You will love this pie. I have never had that cocktail though I have wondered about it. I can't wait to try this. What a fun recipe, Karen. Thanks Cam. I now want to try one! Your pie looks delicious. 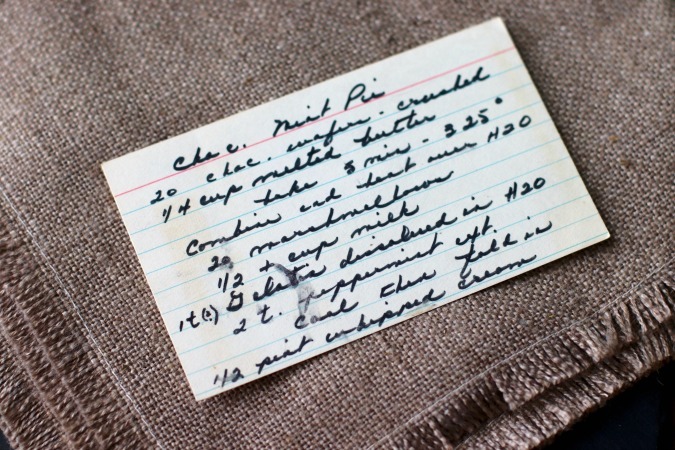 I love that you still have the recipe card your Mom wrote! Thanks Val. I'm guessing it is 25 years old or even older! This looks delicious. I love those family recipes that leave a some fuzzy ingredient lists or instructions, some of them leave plenty of room for creative interpretation! This pie looks absolutely scrumptious! This is my kind of pie! Holy deliciousness! The flavors are awesome and I love that you have both ingredients with alcohol and non-alcohol. I would love to make this for the kids. Thanks Eileen! The kids will luuuurve it. Love that this is no bake, and I'm a sucker for a chocolate cookie crust! My kids will love this pie! Perfect for summer when it's too hot to cook. This is perfect for St. Patrick's Day today! Yum! Two of my favorite flavors! 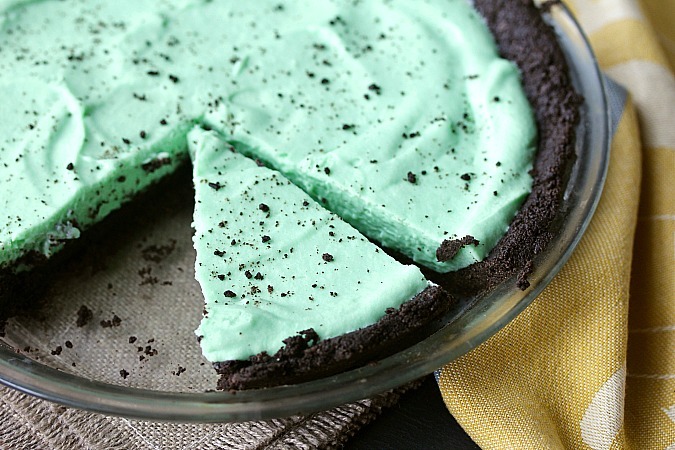 I love this version of grasshopper pie! So rich and creamy! Thank you. I need to make this more often!